Our full color brochure will be mailed to your address free of charge. Our brochure will guide you through what is included in each of our 11 hunting opportunities. We are Wyoming's largest outfitter with 750,000 leased acres in Wyoming & Montana. Take the first step towards a big game hunt with SNS Outfitter & Guides by filling out the brochure request form below. To receive a free copy of our color catalog of hunts, please complete the form below. 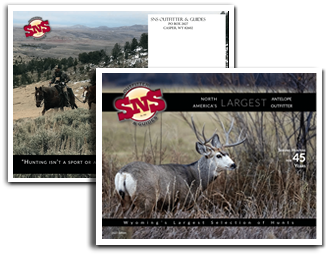 Thank you for requesting a brochure from SNS Outfitter & Guides. A full color SNS Brochure will be mailed to the address provided, you should receive it in about a week. The ultimate big game hunting experience in Montana or Wyoming. Get a free hunt catalog. © SNS Outfitter & Guides. All Rights Reserved. Outfitter Web Site Design by Waves Web Design. Stay up to date on SNS Outfitter & Guide news by signing up to our newsletter. Click the link below to get started.